Pocketburgers.com: Surfing at Night: Is This Guy Bloody Crazy Nuts or What? Surfing at Night: Is This Guy Bloody Crazy Nuts or What? 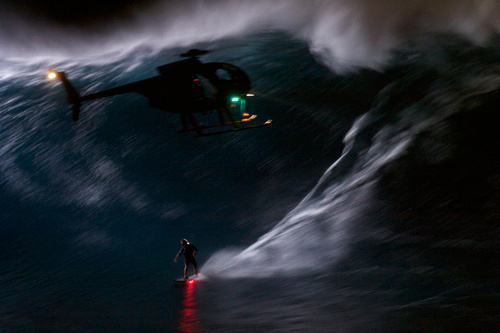 Famous surfer Mark Visser got his board and a couple helicopters to Jaws, the huge wave reef on Maui Island, Hawaii. Then, at night, he tried to kill himself. I mean, he went out surfing 40-foot waves at night. The shots of him riding a 40-foot wave is so perfectly awesome that it looks computer generated at times. But it's not. He was wearing a buoyancy vest and a modified surfboard with built-in LED lighting. The lighting technologies were created especially for the project by Solus Corporation using ground breaking NASA submarine lighting to ensure the wave and board were lit in the right places, at the right time and illuminated the wave without hindering the vision of Visser, the jet ski drivers and the helicopter pilots.